I have the CPM S110V version. I use it every day for eating, food preparation, fileting, cardboard cutting, cutting vegetables, etc. I can't feel when i am using: light and comfortable. CPM S110V edge retention is extremly long, but take care the brittles. Not for hard plastic, hard wood, cutting bones, etc. I think the CTS BD1 version is tougher. Tha lock mechanism is stable, no blade play. 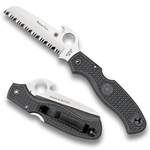 The FRCP handle is stiff, only a little flex, if I hold hard (other spyderco frn handle is more flexible). Like a work knife, the a build quality not high end (mechanism, edge etc. ok, but not fine work). 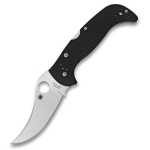 Made in USA, but nowdays spyderco top quality came from the Taiwan factory. Light, soft material cutter workhorse. The ball bearing lock ruinded this knife for me as it is far to hard do close the knife one handed. If you are used to benchmades axis lock dont let the looks fool you. This is a differnt type of lock that is very strong but also very unpractical and unsecure at the same time as i was alway either tempted to use both hands for closing or had a hard time closing it the my thumb. This is the only critique i can find on a otherwise great design but unfortunately it overshadows all plus points...i gave the knife away after a few wees. The sweetest EDC I've owned and my first Spyderco. So lightweight, yet solid in my grip. Ball bearing lock is way better than expected and better than liner locks or frame locks I've owned. Love it so much I'm thinking about a Manix 2 XL! Give it a huge thumbs up for an American made knife that's affordable to nearly everyone. This is one of my favorite EDC blades. GOOD- good price, lightweight, BD1 steel is great quality, comfortable handle, good pocket clip, rolling lock is easy to use. Bad- finger choil is not need, handle feels cheap. I bought the Manix2 Lightweight in Translucent blue and it's my first ( though not last) Spyderco. I absolutely love this knife, it screams American made quality. 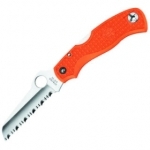 So light you forget about it, the ball bearing lock is superb, the blade is surgically sharp. 10/10.